With the last rays of sunlight speckling the departures area at Liberia's international airport, passengers queue patiently to go through medical screening designed to show up the Ebola virus. Roberts International Airport, a former United States Air Force base built 55 kilometres (35 miles) outside of the capital Monrovia during World War II, is at the front line of a new battle -- to halt the spread of the most deadly outbreak of the tropical fever in history. "We put so many processes in place that... focus on the safety of the airline, safety of the crew, safety of the passengers, and most importantly to boost the confidence of those who use our airport," says Binyah Kessely, director of the board at the Liberia Airport Authority. Kessely's job -- once simply to ensure the smooth running of the airport -- is now to help contain an epidemic that has killed more than 1,500 people across west Africa this year. He is frustrated by travel bans imposed by several African nations which global health authorities say is hampering the response to the outbreak, but he says he understands people's worry. "When you have a situation like the Ebola disease, not many people understand. From what I understand the Ebola disease has a death rate from 50 to 90 percent," he said. "That, as a human being, will create fear in any one." Kessely says eight of the 11 international airlines serving the airport have suspended their flights. The decision was triggered, he believes, by African countries neighbouring the Ebola zone, such as Ivory Coast and Senegal, to put travel ban on Liberia. The first confirmed case of the deadly virus was reported in Senegal on Friday -- the first time a new country has been hit by the outbreak since July, a day after the World Health Organization warned the number of infections was increasing rapidly. Kessely blames Liberian-American Patrick Sawyer, who brought the virus to Nigeria and who died in a Lagos hospital on July 25. "One of those airlines that suspended their flights is the one that carried the late Patrick Sawyer, who was the individual that created this nightmare for us in the region and globally to be quite frank," he says. "The airlines that suspended their flights did it not because of a lack of measures at the airport but because of fear of the spread... due to the rampant nature of the disease." In an effort to regain the confidence of Liberia's neighbours and countries further afield, the airport authority has stepped up screening. Every passenger is now checked by a team of nurses at the departure and arrival gates. "As passengers come in, we give them their forms. Each passenger fills in their own form, we take their temperature, they wash their hands and they go in," nurse Gloria Nelson tells AFP. "When your temperature is high, we take you to the secondary area for questioning that will enable us to determine the next step." 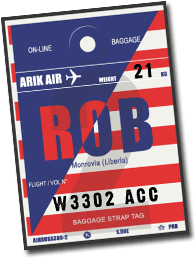 Passengers leaving Liberia are largely stoical about the new regulations, accepting that it is better to go through screening than to risk exporting Ebola. "I think it is just good to take these security measures so that everyone can feel safe while travelling," said passenger Catherine Bajar. "It is a good thing to do and I don’t feel embarrassed about going through this as long as the thermometers are reading properly." Musa Bility, the president of the Liberian Football Association, who told AFP he was leaving the country on official business, said the travel ban imposed by some African countries showed a lack of solidarity. "It is shocking for African countries to have travel bans on Liberia. It is un-African. In Africa we open our doors to one another. Liberia opened the doors to these countries when they were being colonised. "While we are fighting Ebola they are closing their doors on us, it means we have to revisit our relationship. It is embarrassing," he told AFP. The sentiment has been echoed by the Liberian government, which admitted on Friday that flight cancellations had become a "serious concern". "Partners of the government, our national and international economic actors, are finding it difficult to leave or come to Liberia as most of the airlines have been for more than two weeks now, cancelling their flights," information minister Lewis Brown said on public radio on Friday.